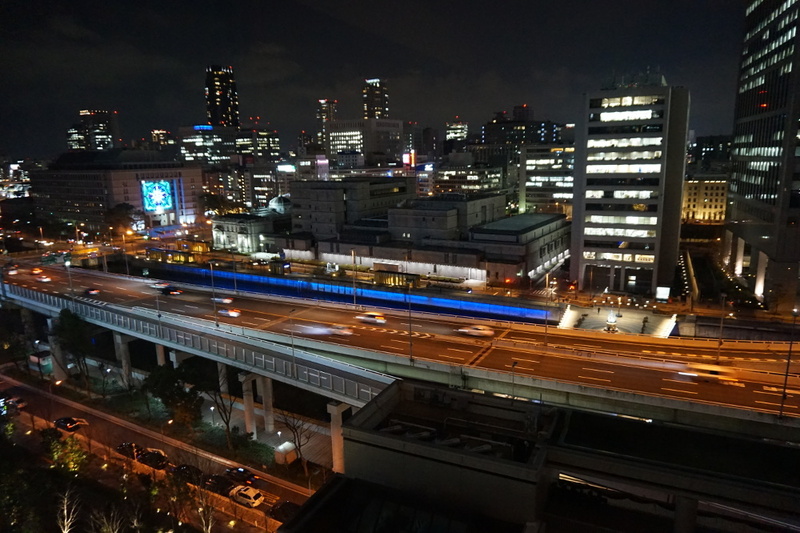 I had the pleasure to visit the Open Source Conference (OSC) 2013 in Tokyo, which took place at Meisei University located on the outskirt of Tokyo. 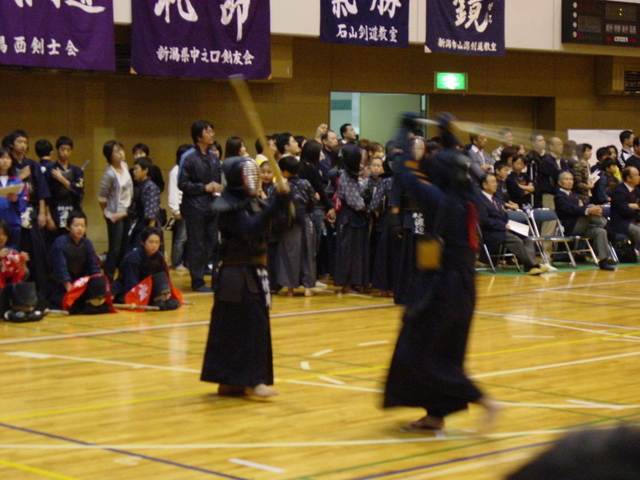 They do organize these OSC’s on a very frequent basis throughout the year, being hosted at various cities across Japan. 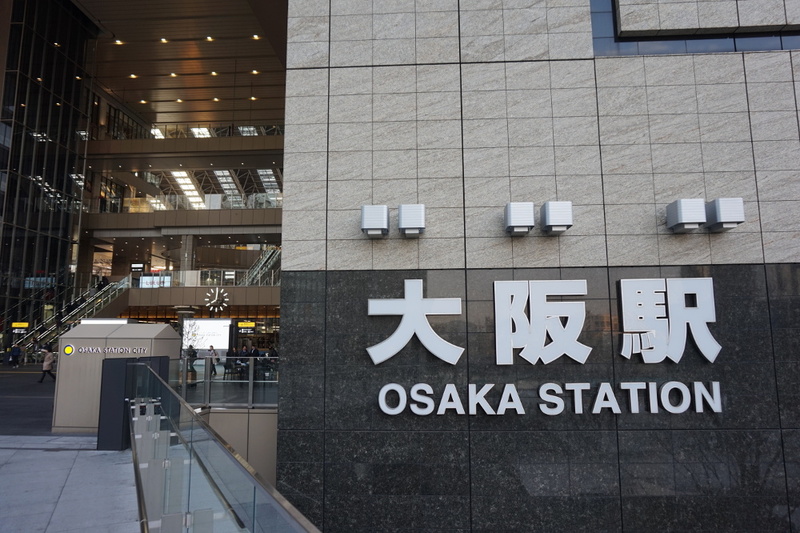 Normally I don’t travel to Japan just to visit OSC mainly because of the distance; being located in the East Coast of the United States, it’s a big hassle to fly to Japan, not to mention the cost. Despite this, I wanted to visit this particular OSC primarily for two reasons. I had received an email from someone from the Japan OSS Promotion Forum that I had been nominated for the 2013 OSS Contributor’s Award, and he asked me whether I could participate the award ceremony which would take place during the conference. 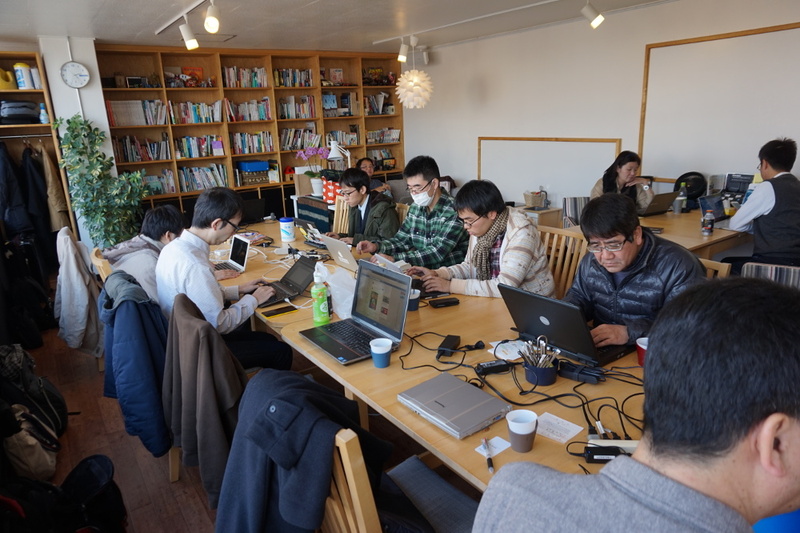 The LibreOffice Japanese team had organized a separate track just for LibreOffice related talks, and I wanted to come and see face-to-face the people who are involved in our project in Japan in various capacities, and learn the latest on what’s going in the Japanese community. There was one difficulty, however. Because I only had one week to arrange the travel (I got the email only a week before the scheduled ceremony date) I could not guarantee my arrival until the very last minute. 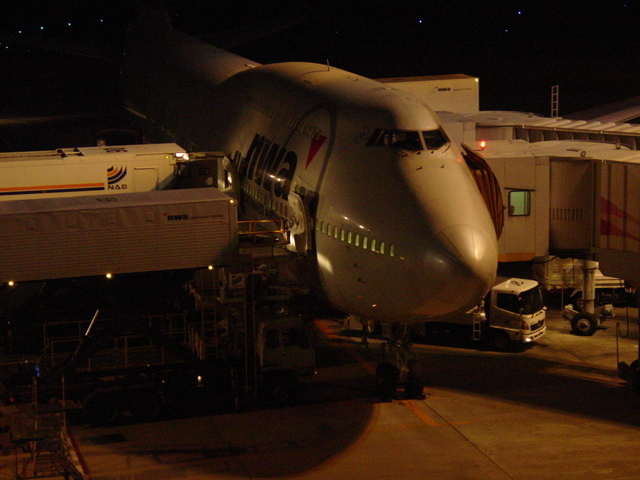 Luckily everything went smoothly and I was able to book my flight and reserve my hotel despite the short notice. 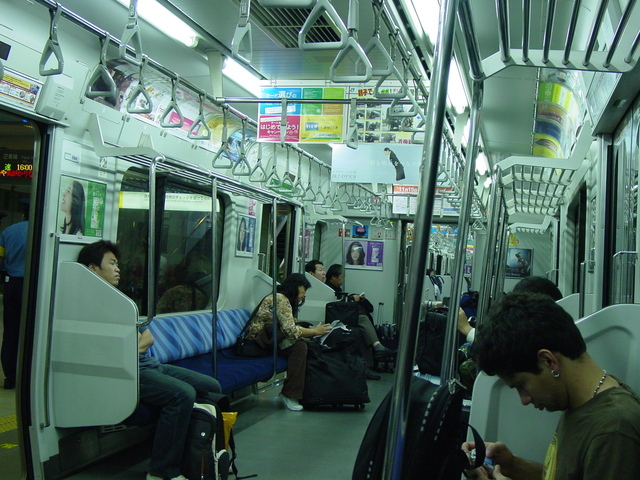 Tama Monorail that takes you to the venue. This is actually my second time coming to this event. My first visit was in 2010. I was planning my trip to Tokyo to attend a different, work-related meeting. Then I learned about OSC Tokyo 2010 which was scheduled only one day after the meeting was scheduled to end, so I decided to extend my stay in Tokyo for just one more day to visit OSC. 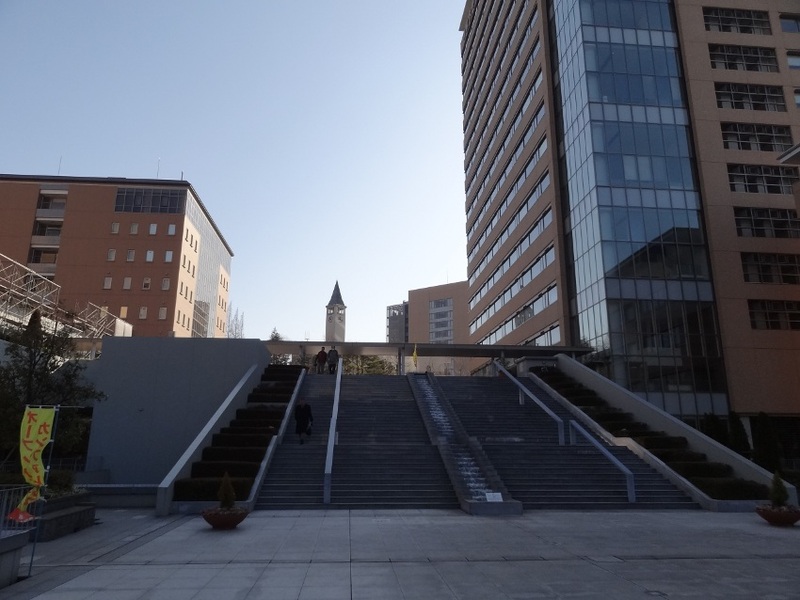 OSC 2010 was also held at Meisei University, so at least I didn’t have to research on how to get the conference venue this time. 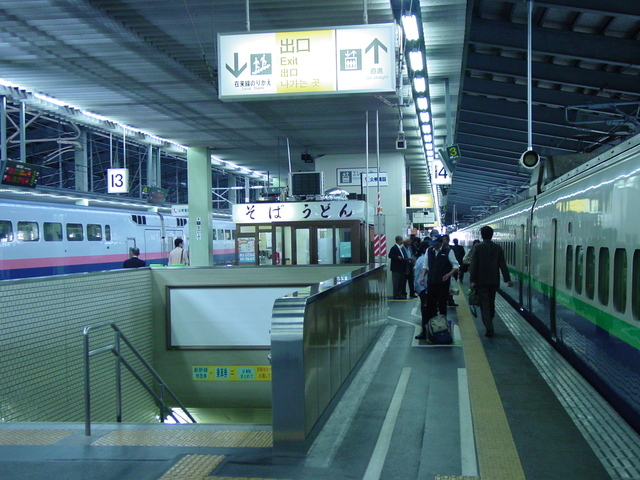 The easiest way to get to the venue is to take the Keio Line from Shinjuku station to Takahata Fudou station, then transfer to the Tama Monorail and get off at Chu-O Daigaku / Meisei Daigaku station. The university is only 5 to 10 minutes walk from there. Once on campus, there were signs all around the place that would take you to the building where the conference was held. Outside the venue, the campus was pretty quiet, and I didn’t see very many students. No conferences are complete without booths. Various projects set up booths to greet the visitors, to distribute fliers and CD/DVD’s, and to inform them of what’s new in the projects. 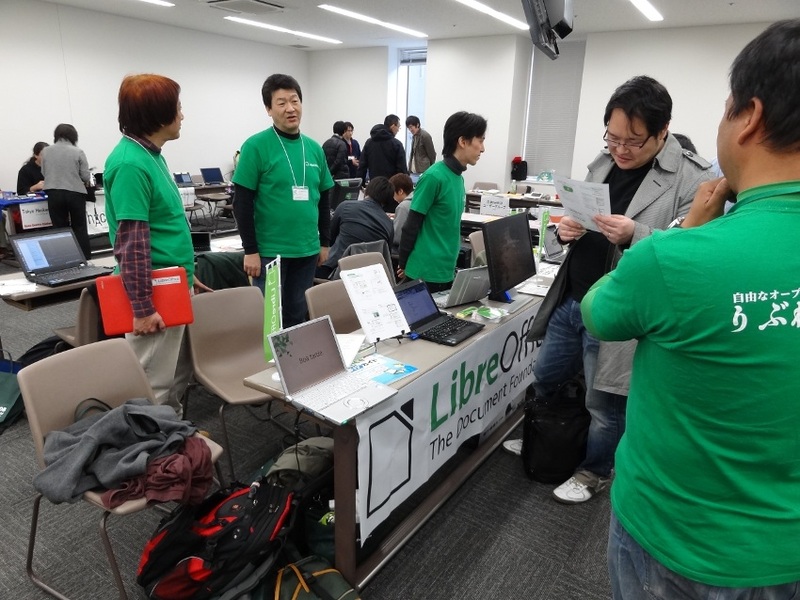 Volunteers from the LibreOffice Japanese team manned our booth throughout the conference. We distributed version 4.0 feature fliers, installer CD’s, T-shirts, stickers and flags. 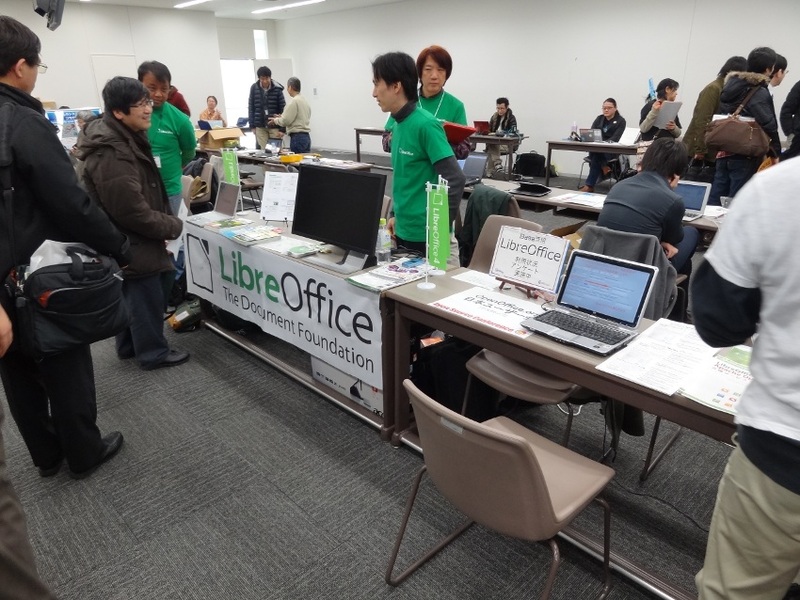 LibreOffice booth and volunteers from the Japanese team. LibreOffice booth, Shinji Enoki (Enoki-san) answering questions. Also present was the openSUSE project booth. Fuminobu Takeyama was single-handedly manning the booth when I dropped by on Friday. 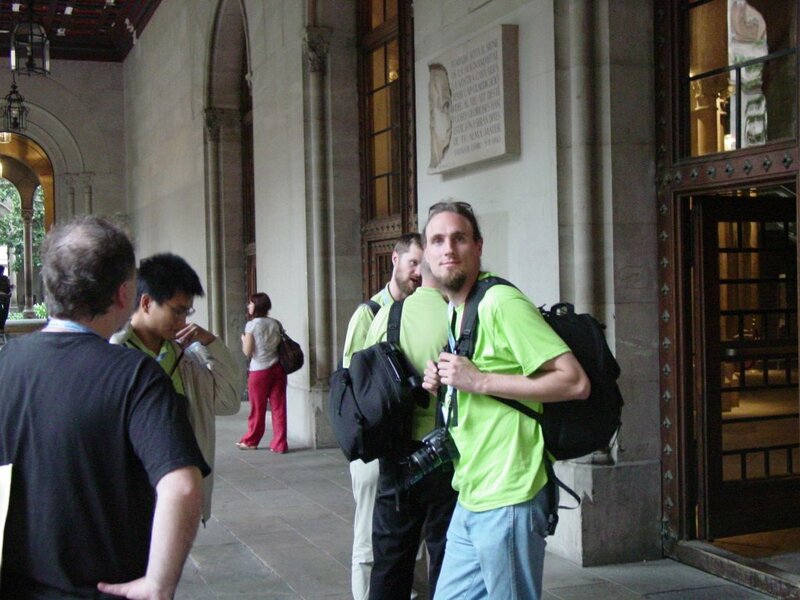 He is a volunteer in the openSUSE project who also manages several packages for Japanese locales. We briefly talked about some issues with Japanese input method in LibreOffice, and how some folks work around it by forcing the GTK VCL backend even if LibreOffice is launched in the KDE environment (because the input method code in the GTK VCL backend is more reliable than that in the KDE VCL). 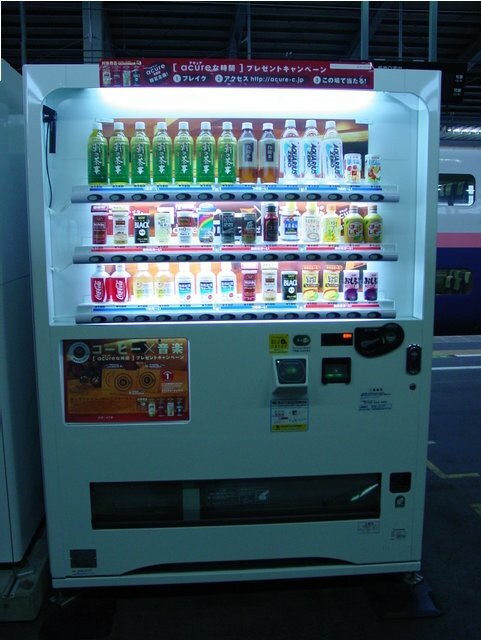 He said he is very much hoping to someday find time to look into LibreOffice code, to solve various Japanese-related issues that are still outstanding in the latest release. Bunch of Geeko’s piled up at the openSUSE booth. Sitting next to them are Japan’s Firefox mascot Foku-Suke. Fuminobu Takeyama looking friendly at the openSUSE booth. The candidates are nominated publicly, and the winners are selected by the Awards Committee. They select four winners and nine incentive award winners each year, and I was fortunate enough to have been selected as one of the four award winners this year. My short talk after the ceremony, outlining my current activities etc. The ceremony was held in a separate, moderately-sized lecture room right next to the booth areas, and was very well attended. Out of four winners, two of us were present to receive the awards: Tetsuo Handa and myself. We each gave a brief 10-minutes talk afterward, outlining our current activities and our future plans. You can find two press articles on this here and here. The official announcement from the OSS Forum is here. 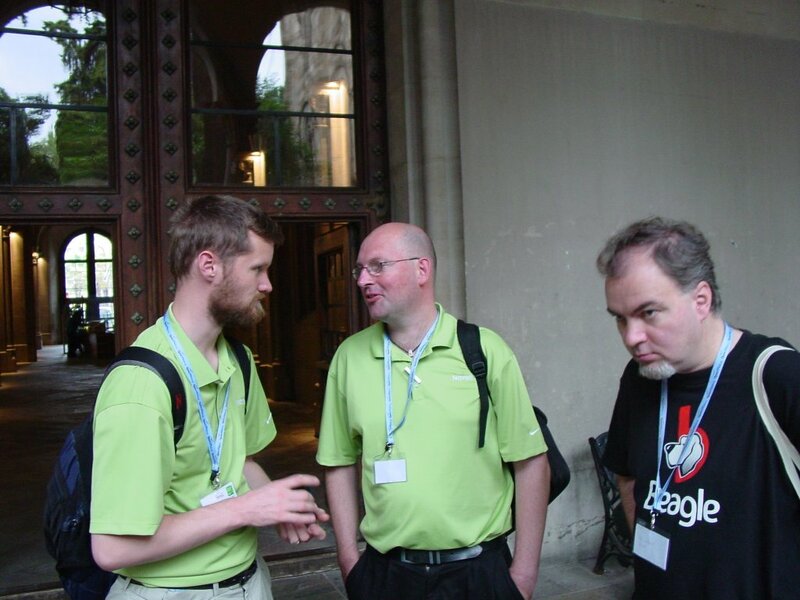 I spent the second day of the conference mostly in the LibreOffice mini-Conference track. According to Naruhiko-san, this is our first ever track dedicated to LibreOffice (and hopefully won’t be the last) held in Japan. We were able to rent a pretty large lecture room for the whole day to host this mini-Conference. Despite the large size, the room was moderately attended. The first talk was by Miyoshi Ohmori, and his talk was about the company-wide migration from OpenOffice.org to LibreOffice at NTT Comware. In his talk, he shared the challenges he faced during the migration and ways to solve them. 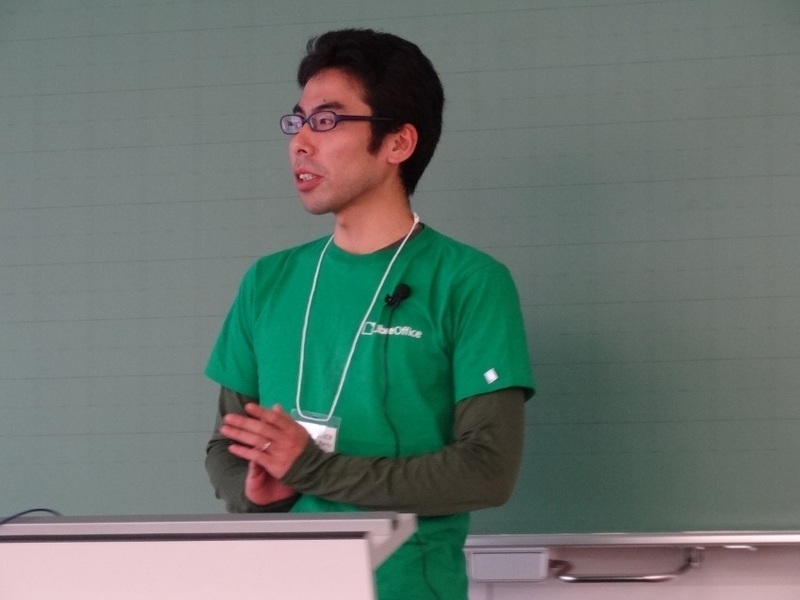 Miyoshi Ohmori talks about migration from OpenOffice.org to LibreOffice. 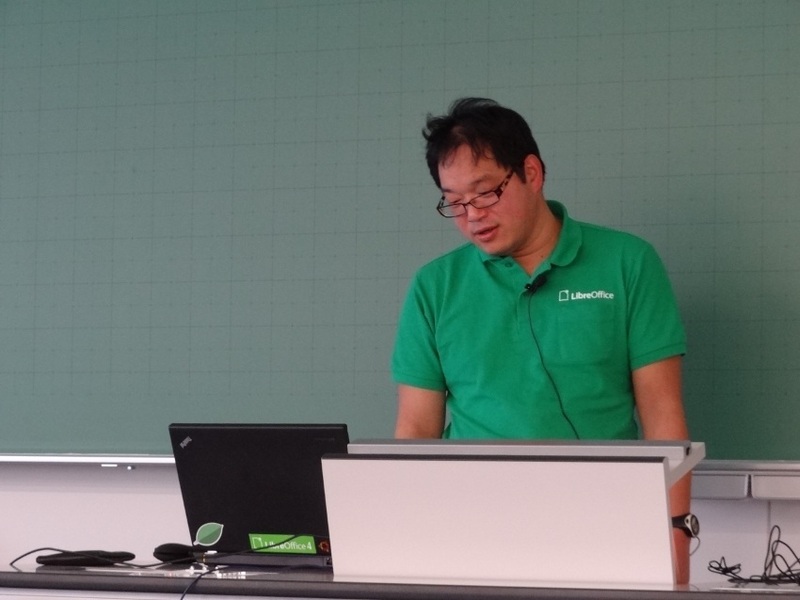 Next up was a talk by Shinji Enoki covering new features in LibreOffice 4.0. He covered all aspects of new features in 4.0, from Firefox Personas support, to Calc’s import filter performance improvement, and everything in-between. 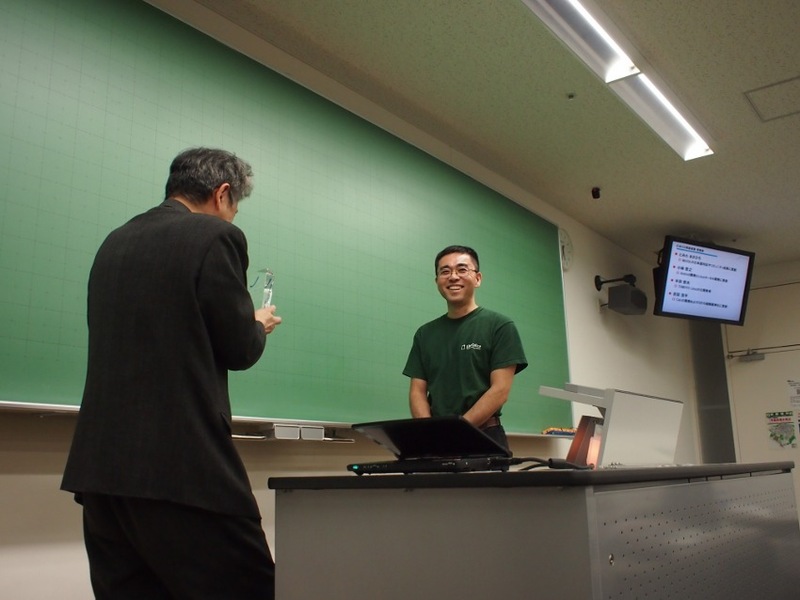 His talk was followed by Naruhiko Ogasawara who shared his experience with his trip to the 2nd LibreOffice Conference in Berlin, how he decided to join the LibreOffice community, and how he decided to submit paper for the conference and eventually travel there. During his talk, Ogasawara-san played the video message from Italo that was created specifically for the Japanese audience. 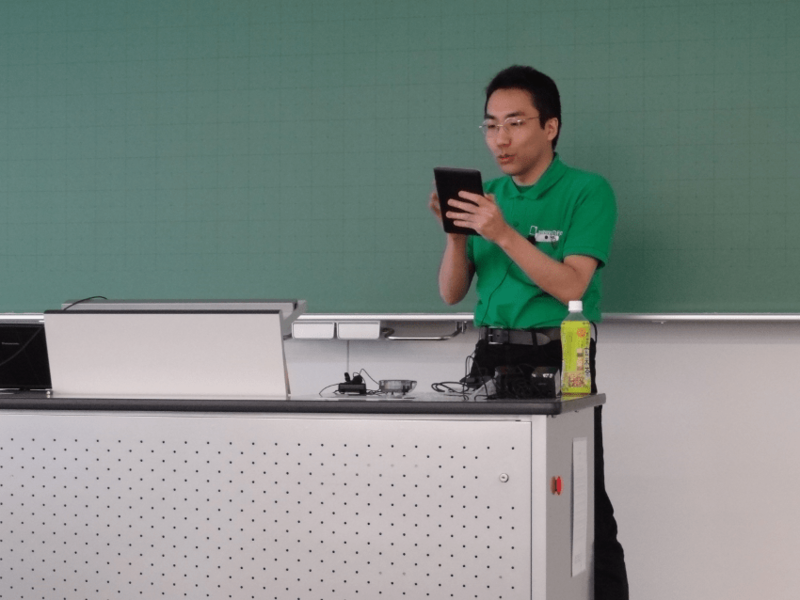 Shinji Enoki talks about what’s new in LibreOffice 4.0. 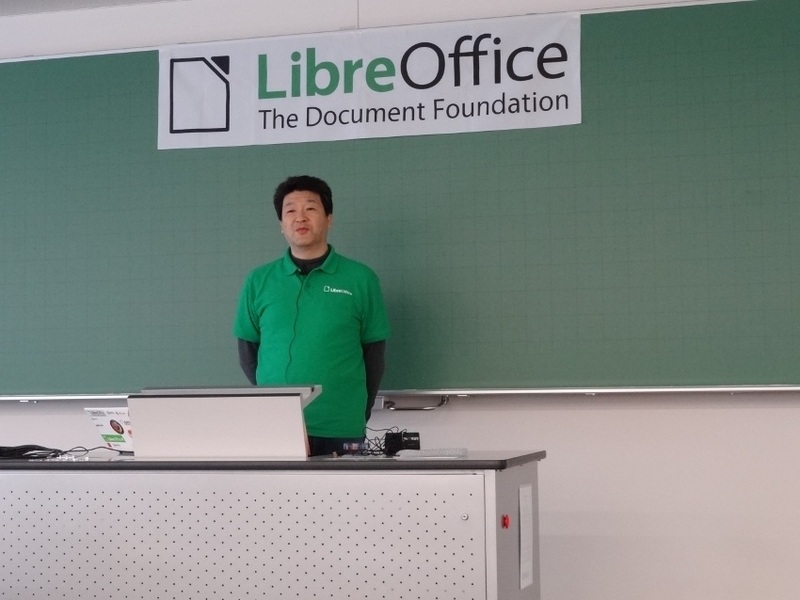 Naruhiko Ogasawara talks about his trip to the 2nd LibreOffice Conference in Berlin. 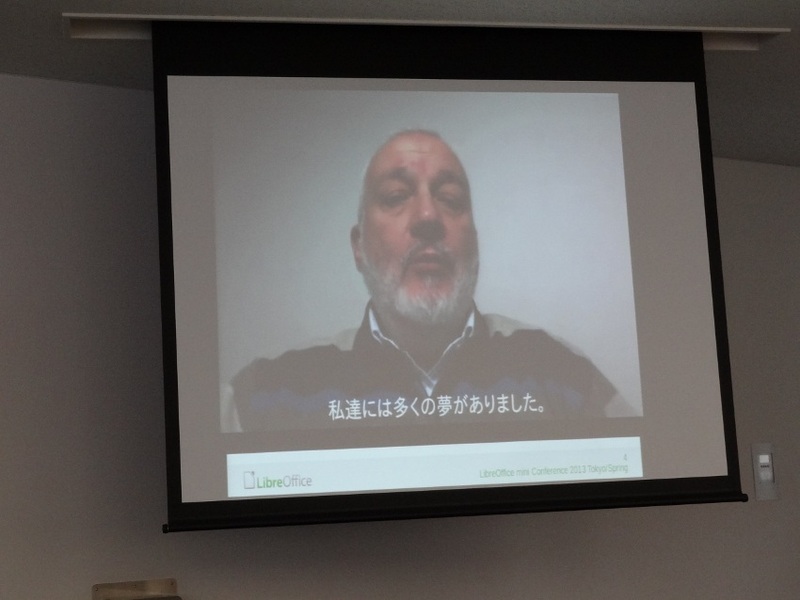 Italo’s video message with Japanese caption. The last talk before the lunch break was by Masaki Tamakoshi. In his talk, he presented a good extension to use to add AutoCAD-like functionality to Draw to make Draw easier and more familiar to use for former (or current) AutoCAD users. He also talked about how to convert AutoCAD’s proprietary dwg files to make them loadable into Draw, and how to create playable animation files from Impress slides, using external tools. Masaki Tamakoshi talks about extension that adds AutoCAD-like functionality to Draw. Jun Meguro discusses how to make professional use of Draw. After the lunch break, Jun Meguro kickstarted the afternoon session with his talk on how to make effective use of Draw to create professional posters. 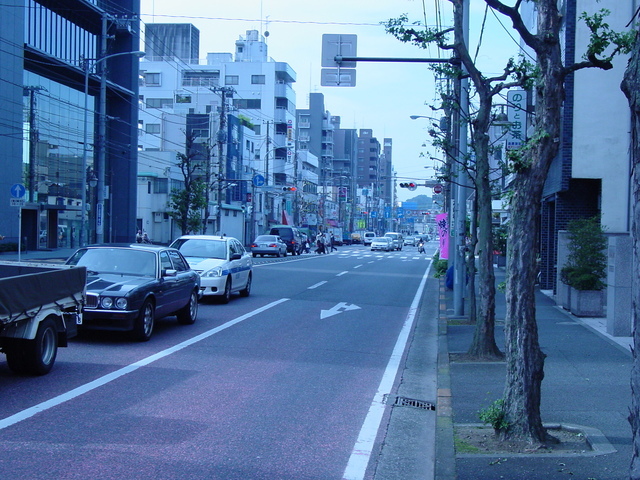 His organization – City of Aizuwakamatsu – is in fact one of the first organizations in Japan that made a large scale adoption of OpenOffice.org when such a move was still not very common, and instantly became the poster child of OpenOffice.org adoption. 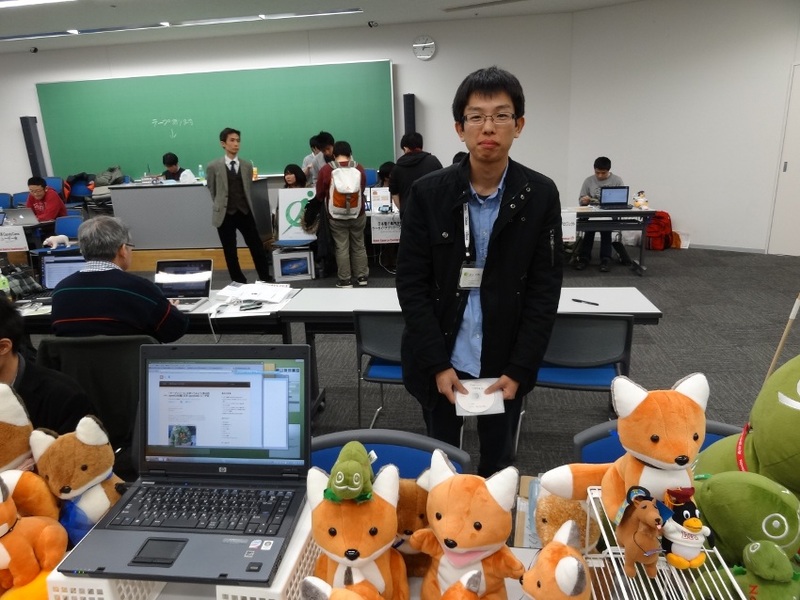 They had later moved on to LibreOffice, and Meguro-san continues to contribute to the LibreOffice project as a member of the Japanese language team. In his talk, he emphasized the usefulness of Draw – the application that may not have received the attention and praise it deserves, and how Draw can be used to create professional posters and fliers without purchasing expensive and proprietary alternatives. He also hinted during his talk that, these days, they can send ODF documents to other local government offices without first converting them to MS Office or PDF formats. This was first revealed when he accidentally sent off a native Draw document (odg) without converting it to PDF, and later received a phone call from the recipient of the document to discuss about the details of the drawing! Although this is an isolated incident, an anecdote like this may suggest that the actual rate of ODF adoption may well be higher than we may have expected. Masahisa Kamataki talks about cloud services that support ODF. 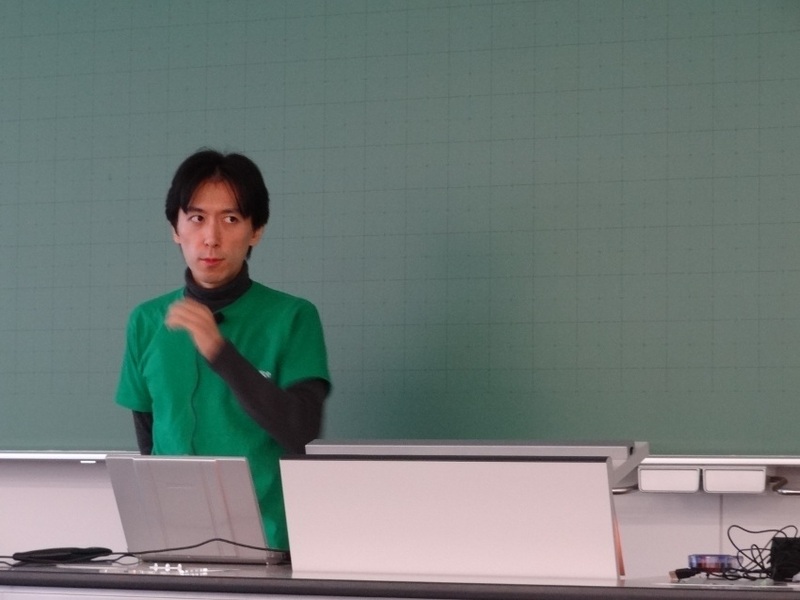 In the next talk, Masahisa Kamataki talked about how to make use of FLOSS office suites such as LibreOffice, combined with non-FLOSS but free as in beer cloud services such as SkyDrive and Google Drive to reduce operation costs. He mentioned that all of this was made possible thanks to the international standard ODF which many major cloud services also support these days. He also demonstrated the level of ODF compatibilities between these cloud services. Ikuya Awashiro conducts his presentation via Impress Remote. Next up was Ikuya Awashiro. He talked about the specifics of LibreOffice Japanese localization effort. 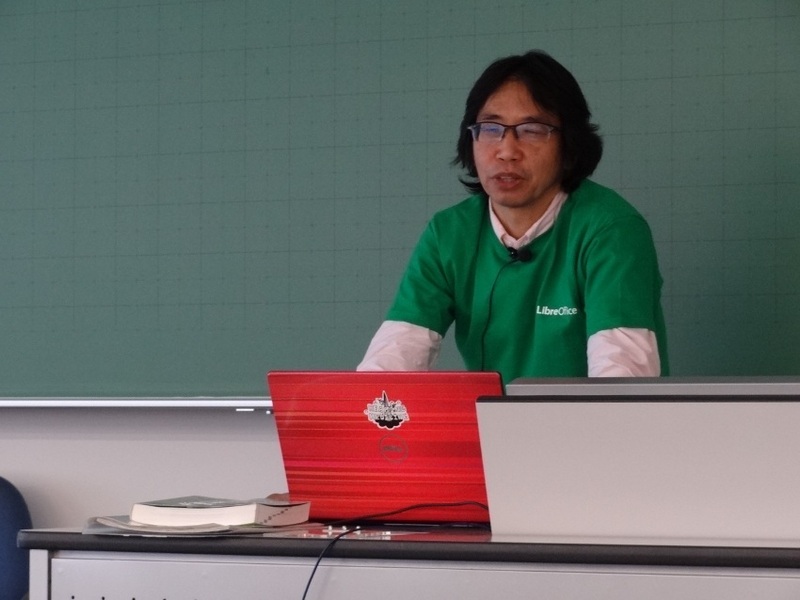 As someone who coordinates the Japanese translation of LibreOffice UI strings, he knows the in’s and out’s of LibreOffice translation which he covered extensively in his talk. 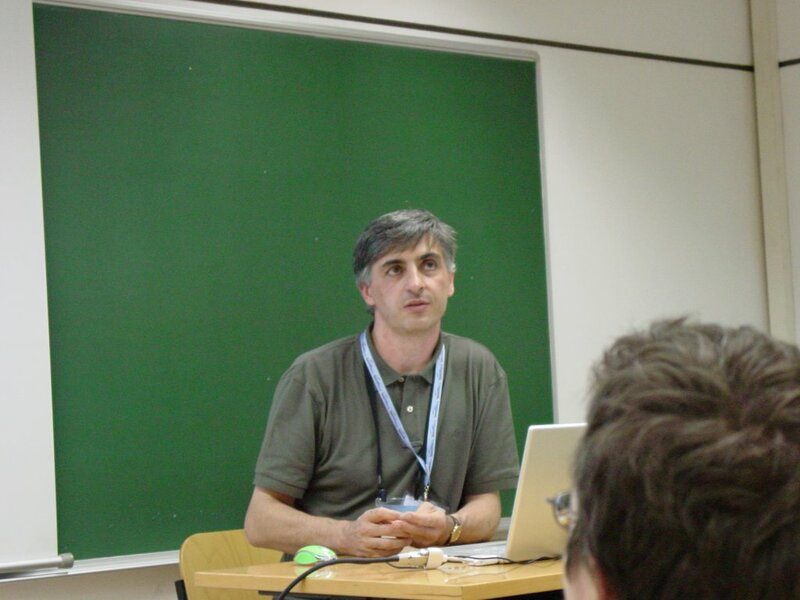 He also talked about the detailed history of the translation in this code base, dating back to the old OpenOffice.org days, and how he learned what not to do in order to successfully coordinate the current community-based translation effort in our project. I should also mention that, of all the presenters we had during this track (including myself), he was the only presenter who used the Impress Remote feature! Makoto Takizawa talks about ODF interoperability between various ODF producers, with live demos using SkyDrive and Calligra. 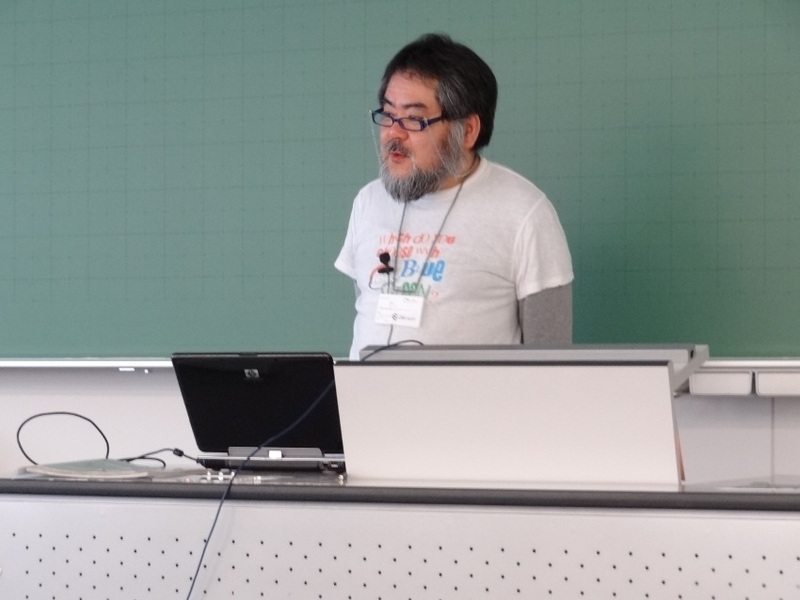 Makoto Takizawa concluded the afternoon session with his ODF PlugFest talk which also happened to be the very last talk in the whole LibreOffice track. He started off his talk with the basics of ODF, including its standardization history, and went on to talk about various ODF-supporting applications and how each of these apps fares on interoperability test. During his talk he noted that, although in theory the use of ODF ensures seamless interoperability between different supporting applications, in reality there are still some nasty corner cases where different ODF producers interpret ODF differently. Toward the end of his talk, he performed a live ODF spreadsheet scenario test using Calligra, Gnumeric, SkyDrive and LibreOffice, to test in real life the level of ODF conformance in these spreadsheet applications. In this particular scenario, Calligra, Gnumeric and SkyDrive actually scored higher than LibreOffice. He concluded his talk by pointing out the importance of the ODF user community assessing the conformance level of each ODF-supporting application, and actively giving feedback to the developer community to improve ODF interoperability between the supporting applications. All in all, I believe this was a quite successful LibreOffice track. We were able to see each other face-to-face which is not very easy to do given how widespread we are geographically. That is true even for those inside Japan, and more so for me. It was unfortunate that Takeshi Abe couldn’t make it for this event. 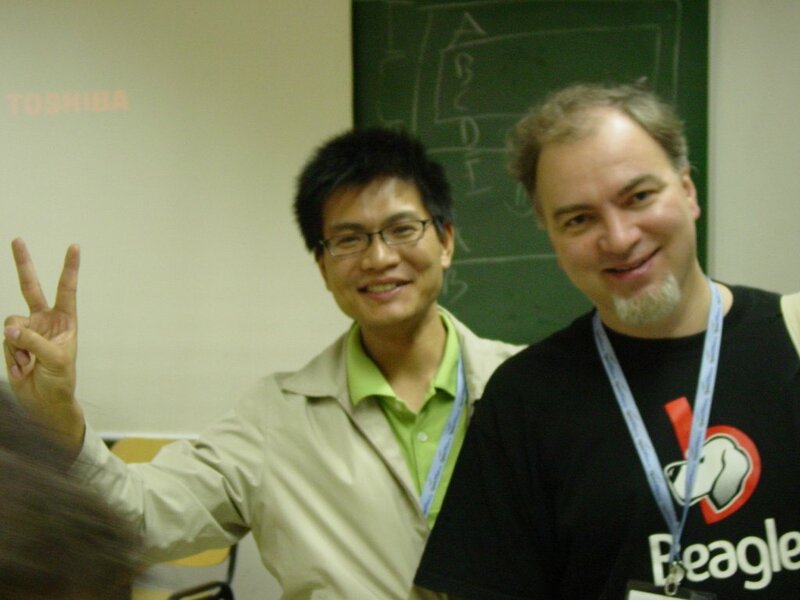 Perhaps we should plan another conference during OSC Okinawa so that we get to see him again. LibreOffice Japanese language team photo. LibreOffice 4.0 launch party photo. This was actually my very first time to participate in OSC Japan as a speaker, and mingle with so many people from various sectors of the Japanese market. 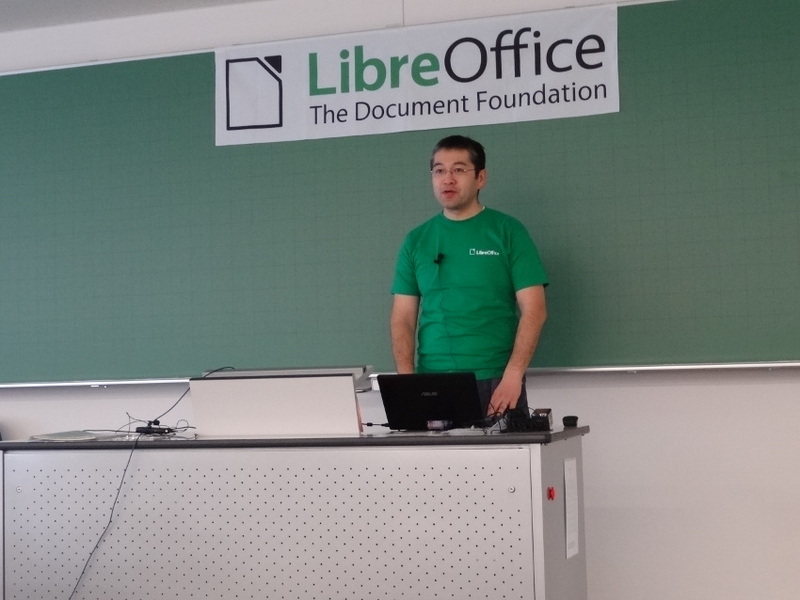 I spoke to quite a lot of people in various capacities during the conference, and I was pleasantly surprised with the level of interest that they have toward LibreOffice. 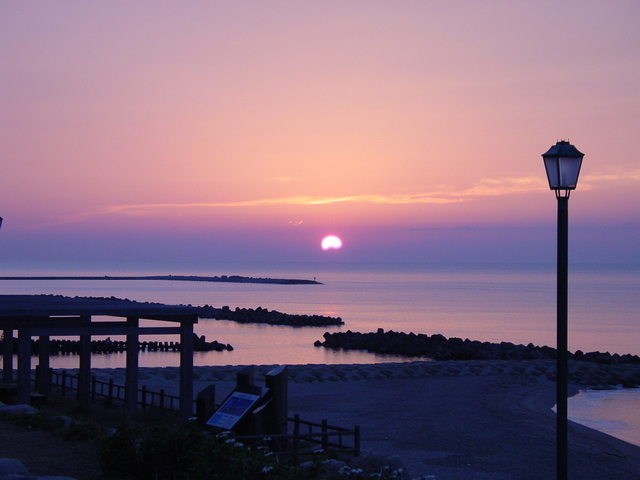 Various local governments are aggressively considering a switch to LibreOffice, with Aizuwakamatsu City and JA Fukuoka leading the way. 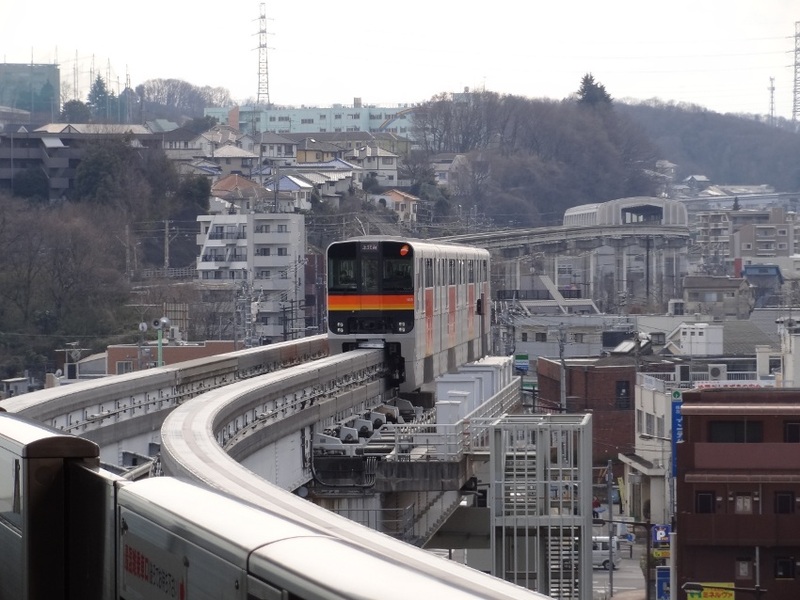 Though the uptake of LibreOffice among Japanese corporations are still slow, Sumitomo Electric has recently announced their adoption of LibreOffice, so others who are still hesitating to switch may eventually follow suit. I also chatted with someone from a local school district working very hard to realize a district-wide adoption of LibreOffice, which suggests that people in the education sector also see value in adopting LibreOffice. 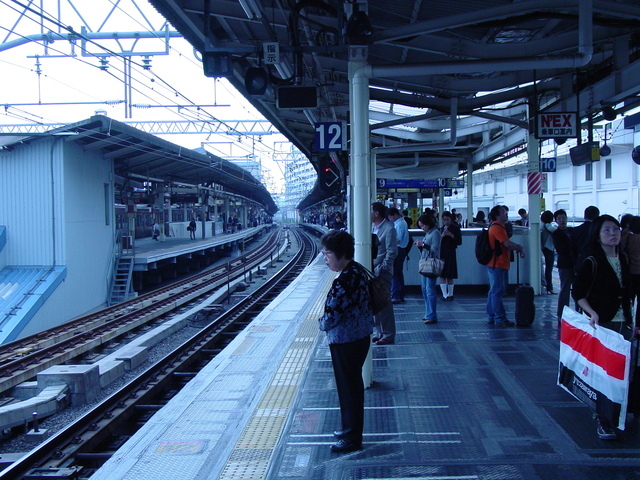 On the other side of the fence, however, we have yet to attract a healthy dose of developers toward LibreOffice from the Japanese developer community. It is my impression that Japan has a sizable Linux kernel developer community, and in fact, many of the participants at OSC Tokyo were kernel hackers. So, whatever reason they may have for not participating in the LibreOffice development, it’s not because of lack of talents and expertize; they are there, contributing to other projects. 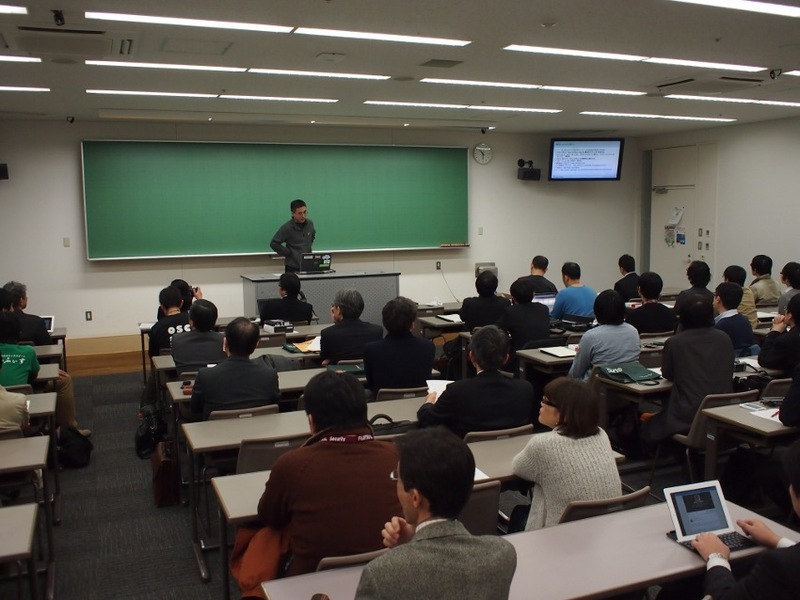 At the same time, I also saw lots of interest in hacking on LibreOffice from various people. So, the interest is there; what they just need is a means and justification to work on LibreOffice. 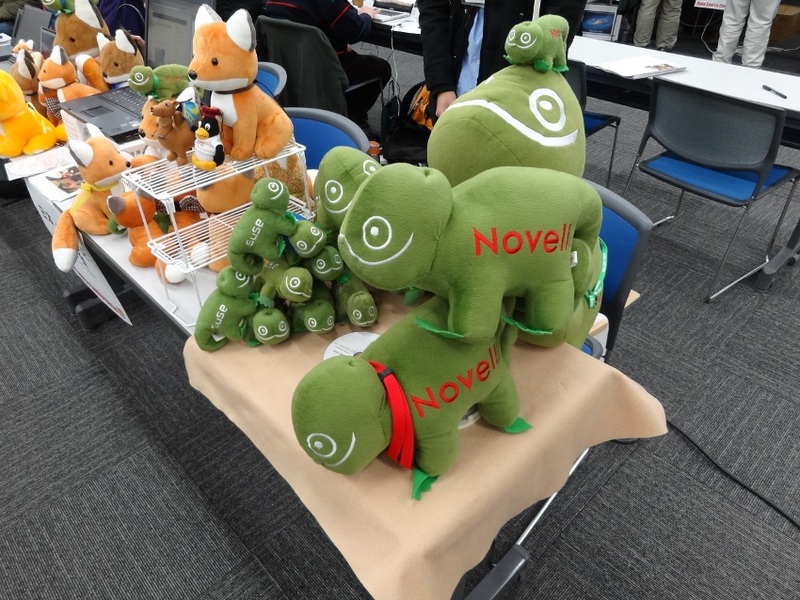 While chatting with Ogawa-san from Ashisuto, who provides paid support for LibreOffice, it is apparent that we are not very far from seeing companies emerging who are very eager to find developers to work on LibreOffice. It is therefore my hope that, by increasing the level of LibreOffice adoption amongst users, the level of interest in participating the development of LibreOffice among support vendors will increase proportionally as a result. 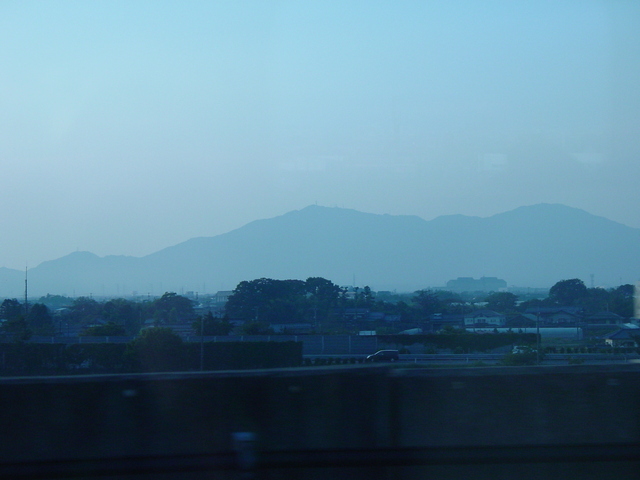 And my own impression from participating in OSC Tokyo fills me with optimism in this regard. I’ve just uploaded the slides for the two short talks I did at Open Source Conference (OSC) Tokyo. 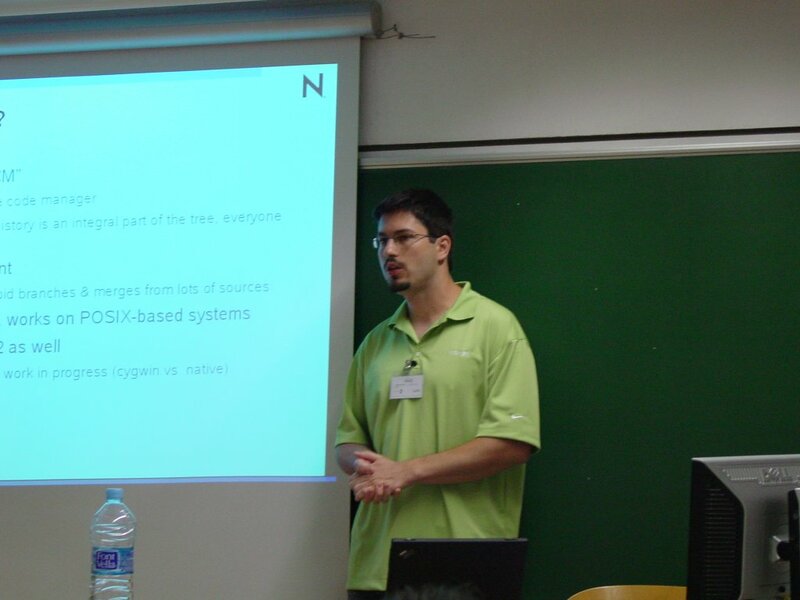 The first one is the brief talk I did after the OSS Contributor Award ceremony on Friday. This is saved as a hybrid PDF; you can view it in your regular PDF viewer (such as Evince and Adobe PDF viewer), or you can open it in Impress to edit it as a normal Impress document. Use this one in case you need it as a pure Impress document. 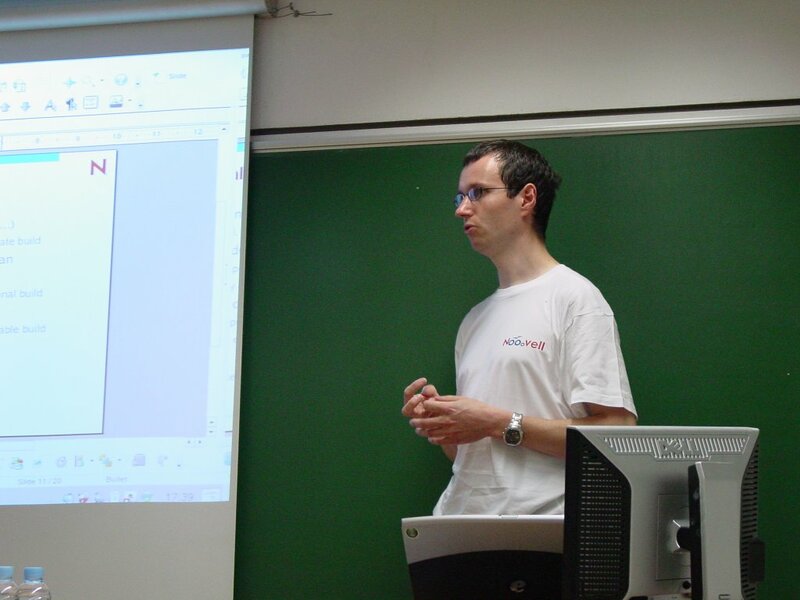 And the second one is for the talk I did during the LibreOffice mini-Conference on Saturday. Like the 1st one, this one is also a hybrid PDF. The regular odp version is available here. 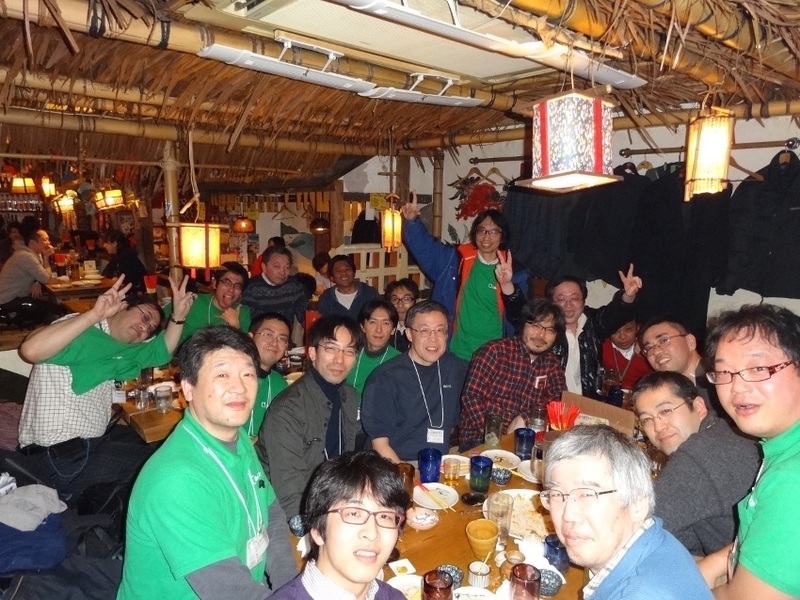 I will write more about OSC Tokyo and especially about the LibreOffice mini-Conference in a separate blog. Stay tuned.